' This function hides a password while it is being typed.
' 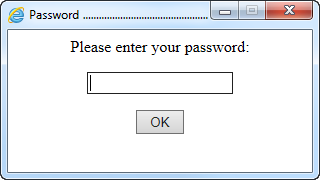 myPrompt is the text prompting the user to type a password.
' The function clears the prompt and returns the typed password.
' This code is based on Microsoft TechNet ScriptCenter "Mask Command Line Passwords"
Summarized: Works in Windows XP or later, only in CSCRIPT.EXE (uses StdOut). Should also work in older Windows versions with .NET Framework installed (look for scriptpw.dll), only in CSCRIPT.EXE. Doesn't work in Windows 95, nor in Windows 7.
' Argument:   [string] prompt text, e.g. "Please enter password:"
If blnFavoritesBar Then wshShell.RegWrite strRegValFB, 1, "REG_DWORD"
If blnLinksExplorer Then wshShell.RegWrite strRegValLE, 1, "REG_DWORD"